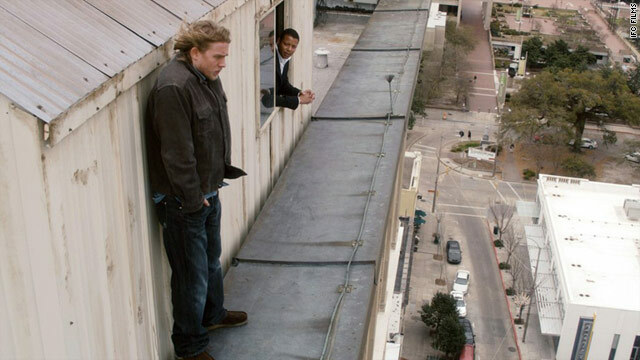 Charlie Hunnam and Terrence Howard in “The Ledge’s” pivotal scene. Standing on the ledge of a building as a police officer tries to talk him down, a man must make a life-changing - and potentially life-ending - decision: Should I jump? He’s not suicidal, but he is in trouble. His decision could save two lives, while ending his. It’s the central scene in the “The Ledge,” an independently produced thriller that opens in New York and Los Angeles on Friday. It’s a story of religion, love and revenge that pits a conservative Christian husband against an atheist who has seduced the religious man’s Christian wife. The film is written and directed by Matthew Chapman, an outspoken atheist who says it's Hollywood’s first offering to feature an openly atheist hero in a story about religious conflict. His mission is to help create a more positive image for atheism, which he says is often misunderstood and maligned, for audiences who may otherwise not be exposed to it. “My hope was to make an emotional appeal,” says. He hopes it’s a “Brokeback Mountain” moment for nonbelievers. Nominated for best drama at the 2011 Sundance Film Festival, "The Ledge" stars Terrence Howard, Liv Tyler, Charlie Hunnam and Patrick Wilson. Despite the all-star cast, one big question around the film is simply whether American audiences will go to an atheist-themed move. The film is also available via the website SundanceNow. Public opinion polling shows that the number of Americans who are unaffiliated with any religion is growing rapidly but that only a tiny minority identify as atheists. A recent Pew poll found that 61% of Americans say they are less likely to support a presidential candidate who does not believe in God, compared with 33% who said they were less likely to support a gay candidate. "This suspicion about people whose only crime is not believing in things until they're proven seems weird," Chapman said. "To me, there is something much more terrifying about voting for someone who accepts things on faith without any evidence whatsoever." Polls show that Americans are becoming more accepting of gays and lesbians, and Chapman credits movies like “Brokeback Mountain,” released in 2005, with aiding the trend. Chapman wants atheists to take a page from that playbook. “The gay movement has a body of work appealing to the emotions of the body it addresses," he says. "Atheists fail at this." Chapman is a great-great grandson of Charles Darwin and has written books about the wars between religion and science, including "Trials of the Monkey: An Accidental Memoir." It’s no surprise that a movie with an atheist hero and a Christian villain is already attracting criticism. Bill Donohue, president of the conservative Catholic League for Religious and Civil Rights, issued a statement this week taking aim at the film. “People of faith, especially Catholics, are used to being trashed by Hollywood, but they are not accustomed to films that promote atheism,” Donohue said. "It was the Judeo-Christian ethos of America that accounts for the unprecedented levels of justice and freedom enjoyed by non-believers." In response, Chapman wrote to CNN that "there are many countries where… non-believers have a far better time of it than in America.” Chapman says his target audience for the movie is Midwesterners who fall somewhere between the religious poles of conservative Christianity and atheism. "I didn't make the film for atheists, but for people in the middle of the country questioning what it's all about," he said. While the "The Ledge" draws bright lines between religion and atheism, S. Brent Plate, visiting professor of religious studies at Hamilton College, challenged the notion that they’re opposing forces. "What I'm interested in is the religiousness of atheism," he said. He has yet to see the film but said he hopes it offers overlapping narratives of how people find meaning in life. "It's very sad that our ability to hold a conversation about certain topics is often reduced (to insults)," he said. Chapman wants to open a conversation about people who don’t believe in God. Whether filmgoers will see his portrayal of Christianity as insulting is yet to be seen. John; They say that the thing you describe as 'spiritual spark' might be a gene. I have never experienced anything spiritual at all. Please dont tell me how you feel when you stare into a wallpaper or the heavens on a stary night. It's not how I feel. So that some people through out our history has had spiritual experiences means nothing. It's some sort of retardation. FAITH vs. CERTAINTY on the Ledge. To say "there is no proof" for the existence of God is such a old cliche. All cultures and civilizations have been fascinated and thrilled by the "spiritual spark within," wondering and seeking that which is beyond, ultimate, God. The position "there is no proof" is a facile dismissal of FAITH of all people throughout history - Sorry, it really sounds like a cheap shot. It's just too easy and simplistic an argument, and disregards out of hand the profound spiritual need to search and desire to know what is beyond our immediate limited senses and knowledge. However, at the same time, I eschew the smug "I know what Godl thinks" position so prevalent in evangelical Chrisian believers, a profound travesty of true spirituality. For truly to experience God, through deepening spirituality, should not produce proud intolerance and open prejudice amongst the "faithful." What a disservice to God, and people. That said, I was drawn into the tension between faith and certainty, in the face of life's conflicts and challenges in the Ledge. At best, it raises timeless questions about God in modern times. Like where is God when YOU face harsh difficulties and fear, and how much does your faith support you in both normal daily life and in crisis? If you have no God, what difference does it make, and how will YOU react in the same situation? We live with these questions as the debate rages on. I thoroughly enjoyed this film. It gives a literal and new meaning to the phrase, "a leap of faith."